Today, let me tell you why I decided to break with Teflon frying pan and get together with an iron frying pan forever. This article is an answer to this awesome article below. Don’t heat it with nothing on it. Never use high heat! 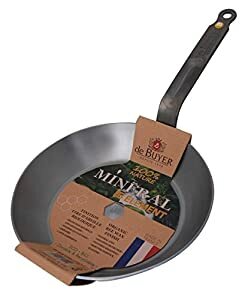 Strength of an Iron Frying Pan? Conclusion 2: Iron Pan Is The winner in Cost Performance and Cooking! In April, more and more people will buy their cooking tools, starting to live alone, relocating, etc. Everyone need a frying pan when they cook. In the case, Teflon frying pan must be the first choice since it’s so convenient! With the super slippery pan, it is very easy to cook omelet or fried dumplings (gyoza). Mr.Teflon is very good at baking hotcakes too. That’s cool. After using the pan, you just wash it with water and wipe it with a paper towel. A Teflon pan does not get so dirty as it doesn’t need oil. Fuss-free! Maybe eco-friendly? Can you find weak points in such a super-easy Teflon pan…? Yes, there are some. OK, let’s check them out one by one together. You may be in a mood of “Super strong fire!” especially when you are making some fried rice. NEVER. (I DID). If you think why not?? ?, read the next paragraph. OK, I will give you a rough explanation. Teflon is a brand of DuPont, the largest chemical company in the U.S. It is a material called “fluorine resin,” which has unique features. The most remarkable characteristic of the substance is the ultra-low coefficient of friction. I mean, it is so slippery that never stick to other matters. What’s wrong with the Teflon? 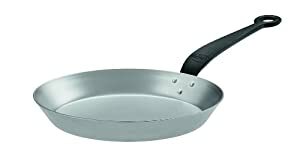 When manufacturing a Teflon pan, they use PFOA (perfluorooctanoate), which is referred to as carcinogens. 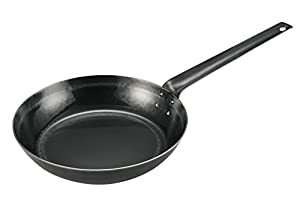 Furthermore, a teflon frying pan emits poisonous gas when heated to 680F. For details, please refer below. Teflon on the pan comes off so easily. I used to use T-fal pan with a removable handle for many years. Partly because I am a strong-fire-lover, Teflon did not last more than two years, so I had to got a new one periodically. 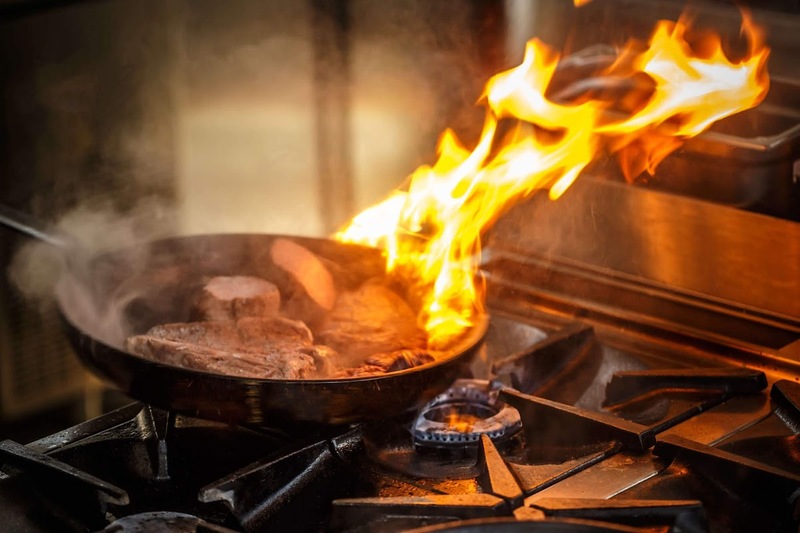 There are other reasons for the fast depletion of Teflon other than high heat. One of them is the structure of Teflon-coating, which has minute holes called pinholes. Water enters them, leading to deterioration of the coated surface. <Weakness of fluororesin coating? 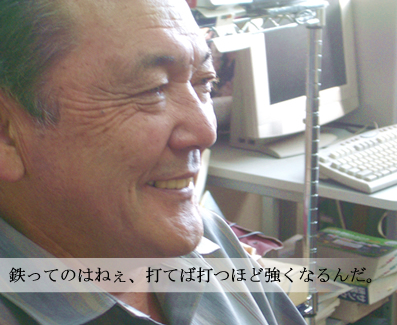 Be careful to “pinholes”?> NITTO KINZOKU KOGYO Co.,Ltd. So, don’t boil spaghetti or fry tempura with a Teflon pan. Water and oil in those pinholes damage Teflon. Yes I did these acts too and that’s why my T-fal do not last more than a couple of years. On top of that, you are not allowed to use an ordinary metal flipper or bamboo chopsticks on a Teflon pan. You should use a flipper made from silicon and other soft material specialized for Teflon. Noooo! I cannot cook without high fire because I am a self-proclaimed Rosanjin, a Japanese legendary culinarian, at a cabin in Tokyo. Now I know that I am not a Teflon person. You can never cook “Rosanjin-style Sukiyaki”!! Nevertheless, I bought T-fal six times (for more than 10 years). I must have intook tonnes of PFOA (perfluorooctanoate). That’s so awful, though I’m still alive. I believe that “low carbs + exercise” is the strongest method for body making and pursue the concept. I am, at least, trying. According to this theory, your over carbs make you fat, and good oil can burn your fat. If you’re not familiar with low-carbs diet, see the follow. 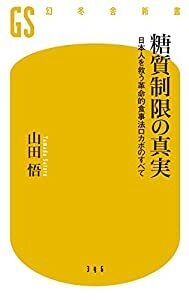 I read the book by Dr. Satoru Yamada, the writer of this column, and it totally blew my mind. What was my years of endurance for meat and fat & oil? The book is full of “the latest medical commons sense” clarified in an easily understood manner. 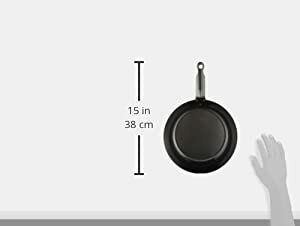 It is convenient to use a non-stick Teflon pan which does not need oil. Given that it cannot be put on high heat and the coat will come off in a few years, however, the cost performance is low. 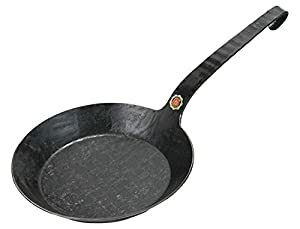 Iron is the most orthodox material for a frying pan. As you’ll understand by the word “the Iron Age” Hittite in 15th century BC, Iron boasts a long history. Simply to say, that’s tradition and legend. Iron cookware used to be essential for Japanese food life. An iron “gohan-gama” for cooking rice, a “tetsu-nabe”, iron pan, for sukiyaki, etc. and a “tetsubin” for tea serving. While you can look these items in historical museums, they are still used in today’s life. Why did our ancestors depend on iron cookware? Iron cookware absorbs extra meat fats. When frying vegetable, it evaporate extra water. You can fry rice perfectly and bake pan cake softly. Wow! Iron cookware has such a deep, rich history! Iron has have good thermal conductivity and retains heat well. That means, once you heat an iron pan, it remains hot for a long time. >>Perfect for grilling steaks as the temperature of the pan does not fall when you put meat. Great for rice cooking thanks to the high heat conductivity. The burnt surface of an iron pan can be fixed just by scrubbing. >> This is so nice. Simple enough to attract your minimalism mindset! As much as you use, the surface of the pun is coated with oil, gleaming black. After a few years, it become non-stick almost as Teflon pan. >> That’s nearly true. You can intake iron accordingly. >> Intaking too much iron is bad for your health of course, but most people are actually lack of iron. I strongly recommend using an iron pan especially to women who are suffering from anemia. Then why Teflon pan is so popular? That’s because, as for an iron pan, you use oil, gets dirty, old and black, so it doesn’t go well with my beautiful stylish kitchen… Are you serious? No wonder you have been using a number of Teflon pans. 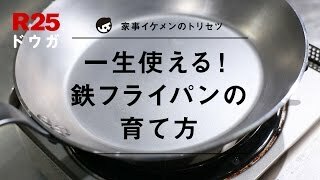 As a Teflon pan costs more than 3,000 yen, you spent 18,000 yen for the six replacements. That's a waste of resources and money, right? Non-eco-friendly as tall! And, how much did you intake PFOA (perfluorooctanoate) and toxic gas? Then, how about dishes other than pancakes? Not very nice, ha? 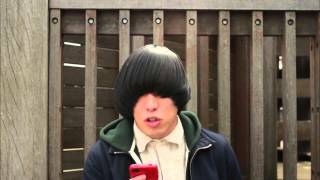 I believe you can lose weight by doing Kyle Hanagami dance every morning while you have some good-quality oil, rather than non-oil diet, can’t you? Some would say that it must be troublesome to take care of a iron pan. The answer is yes and no. First of all, when you buy a new iron pan, you have to burn it until it gets blue. Refer to the video. Second, always add some oil first on it before heating. After usinging, wash it with water without detergent, evaporate water with heat and grease lightly. That's all. Did you say, “Is an iron pan heavy?” Well, I think heavier is the Teflon one. Not really, I know there are lightweight Teflon pans these day. For iron pan, there are a lot of kinds as well and those for home-use are not so heavy, as around one kg. However, nothing can beat an iron frying pan in reliability. That’s “the Iron Age” Hittite in 15th century BC!! If you are looking for a great iron pan for life, for your SNS, for brand royalty, the following are your choice. They are all countries producing good cars...is this because they are made of iron? Established as a roof materials manufacturer Marktoberdorf in Germany in 1888. Started to produce kitchen tool in 1902. Looks like reliable German automobile. If it go head-to-head with your minicar, only yours will be squashed. In 1857 a skilled blacksmith, Albert Karl Turk, established the company. With a plant in the the Ruhr area with mines, the center of iron products manufacturing in Germany, Turk’s maisters keep producing classic frying pans. It has a super cool website. Products are more expensive than other brands. I like the simple design but a too long handle is a bit concern. de Buyer was established as a cooking tool manufacture in Le Val-dʼAjol in France in 1830. It offers 3,000 kinds of products. A very popular brand. You can trust cooking utensils coming from the country of gourmet. The largest Chinese round-bottomed pan (wok) brand in Japan, with 80% share in Yokohama Chinatown. It is the only Japanese maker which uses the beatening method. President Yamada is hot too! The wonderful point is its short handle! With a 24 cm diameter, the handle is only 12 cm-length. Thanks to this, it can put in the oven and be washed in a small sink. All in all, the handle of an iron pan is too long. It would be convenient in a spacious kitchen with a number of stoves or in the outdoor environment. I am cooking in kitchen of a space of only three or two tatami mats with ONE small stove. Such a long handle is just an obstacle to my work. No need to worry about a too hot handle. You just wrap it with a small towel, that’s all. I don’t recommend a wooden handle, which may decay and doesn’t last for life. Lastly, Endo’s is cheaper than above four brands. It was so sweet at first...but we grow away in a few years. That’s Teflon-pan love. Although we felt clumsy first, our love grow with time. An iron pan will be with you for life. Which would you like to choose? 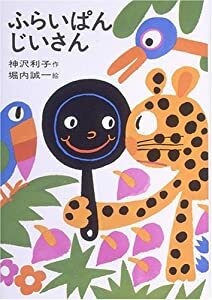 OK, I understand… Incidentally, a stainless frying pan used restaurants is good to check the color of source, but difficult to adjust heat. It is better for professionals. Thank you for your reading to the end.